"This chutney closely resembles imported Indian chutneys and is good with all curry dishes. It is also great with cream cheese and crackers." In a large heavy pot, stir together the peaches, raisins, garlic, onion, preserved ginger, chili powder, mustard seed, curry powder, brown sugar and cider vinegar. Wrap the pickling spice in a cheesecloth bag, and place in the pot. Bring to a boil, and cook over medium heat uncovered until the mixture reaches your desired consistency. It will take about 1 1/2 hours to get a good thick sauce. Stir frequently to prevent scorching on the bottom. Remove the spice bag, and ladle into hot sterilized jars. Wipe the rims with a clean moist cloth. Seal with lids and rings, and process in a barely simmering water bath for 10 minutes, or the time recommended by your local extension for your area. The water should cover the jars completely. 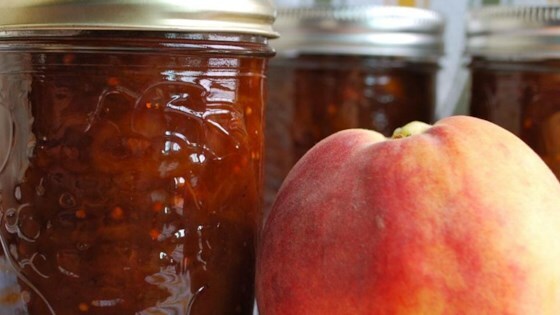 This is a great chutney, with just a touch of heat. My family loved it with a curry dish. This recipe took a loooong time. I know chutney and it took four hours for this to get to the right consistency. However, it did turn out great, so if you have the time, this is a good recipe.